The scent of burning forest hung delicately in the air as we hiked uphill in the early light of a North Cascades morning. 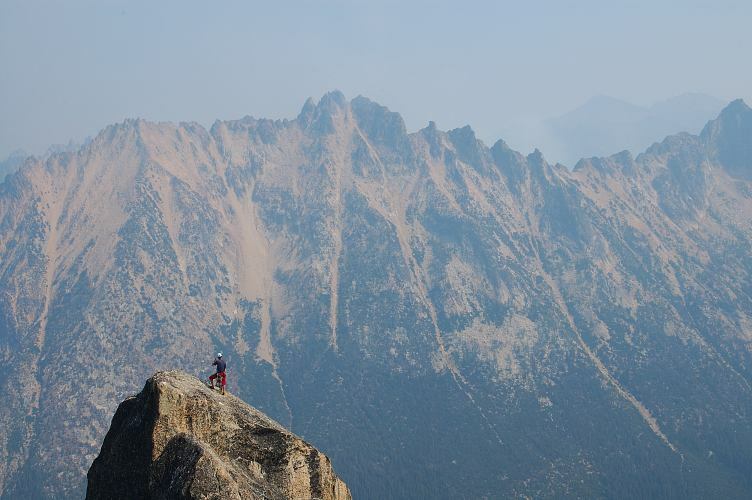 The entire Pasayten Wilderness, a huge, sublime chunk of land had been closed to public use a few days early because of several large fires that had been burning for weeks, and the air had a layer of haze thicker than normal. The six of us had arrived in a variety of vehicles last night and camped at the Cutthroat Lake trailhead in order to get an early morning start on one of the most popular climbs in one of the most popular areas in Washington: South Early Winters Spire. 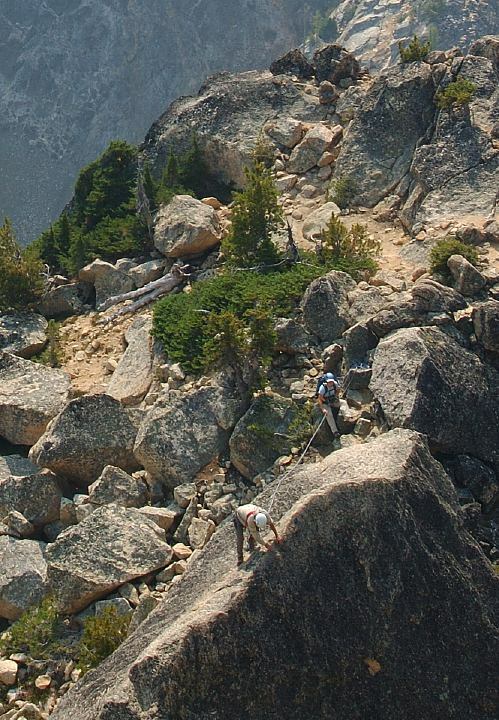 The prominent peak, the right most in the Liberty Bell complex, sees a lot of traffic as it has many routes on it, varying from the easy (South Arete) to the very hard (Inferno), and the access is quick and well defined. Liberty Bell, Concord Tower, and Lexington Tower, form the right hand grouping of peaks in the immediate vicinity and we had already met one party heading there. After an hour and forty five minutes of hiking, we arrived at the base of South Early Winters Spire and found another climbing party just beginning to set up to climb. There was another group ahead of them, already well on their way to the top. We split into rope teams and got our gear ready as the climbers made their way up the first pitch. Once they were away, Joel and I roped together and he set out to lead the first pitch, making short work of the crux friction move at the bottom. 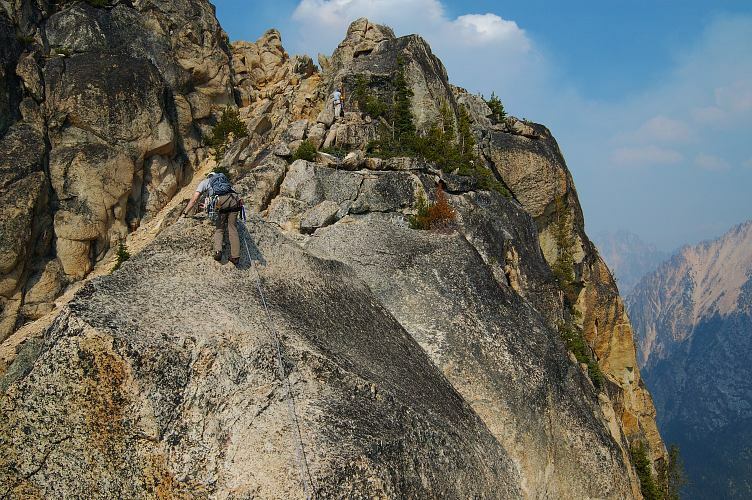 When he had reached the top of the first pitch, it was my turn, in big, clunky mountaineering boots. Up the crack I went, wishing all the time I had something a little stickier on my feet. But Joel kept a tight leash on me and, after a bit of doubt on my part, I stepped across the gap at the top of the crack and was off to the races. 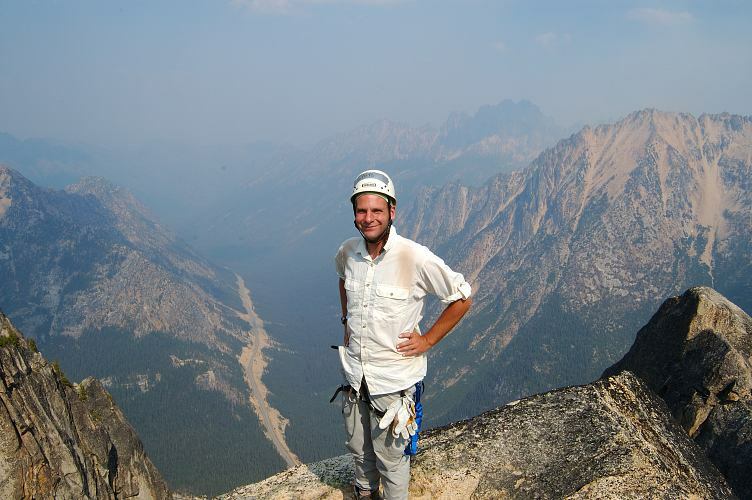 Knowing that I had just passed the hardest part of the climb, I settled into things and reached Joel feeling confident and happy about the rest of the day. 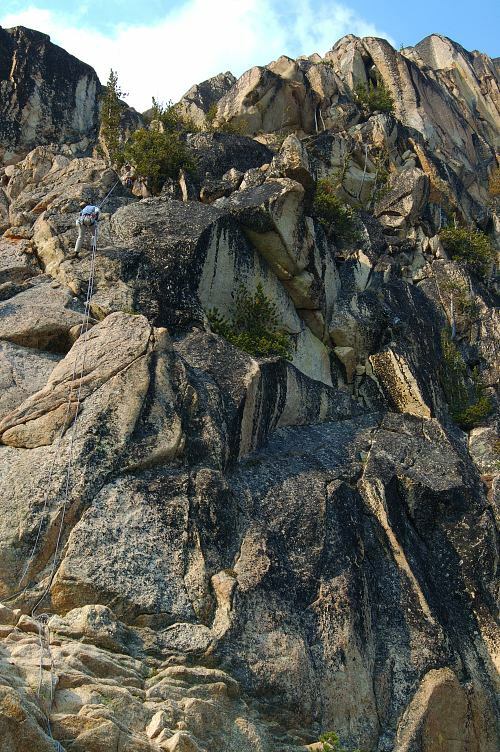 We climbed quickly to through the second pitch, though I had to stop to send my pack up to him so that I could climb a 12 foot chimney at the top of the pitch. 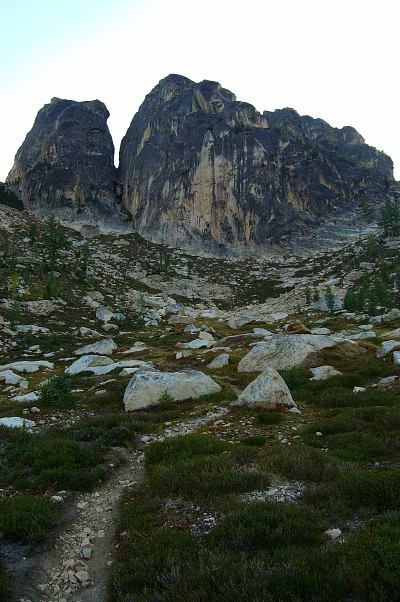 The rest of the route was mostly a class 3 scramble, but with such gorgeous views, despite the smoke from the fires, that it was hard to notice the passage of time. Almost at the top we ran into the Whaleback, an exposed hand traverse that looked a lot worse than it actually was. Of course, a fall would have meant a pendulum swing and a crash into something hard, so I tried very hard not to fall off. With the Whaleback passed, Joel scrambled up and set a fixed line across the last exposed scrambling and, with that, we were at the top of the peak. Two and a half hours had passed, my watch told me, but it seemed only a few minutes before that we had set off. I had experienced this time-is-meaningless phenomenon before, in many different settings, but every time it shocked me. The two other rope teams from our group were not in sight when we crested, and so Joel and I settled in for a wait in a beautiful place. 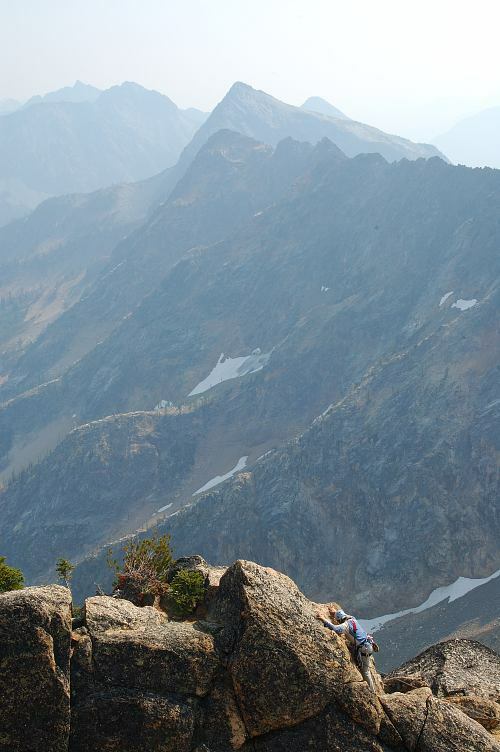 Lisa and Jamie crested onto the false summit and contemplated the Whaleback, followed shortly by Julie and Chuck. As they did, something from the side caught my eye and, turning round, I spied another climbing group that seemed to materialize of thin air on a sub peak next to us. 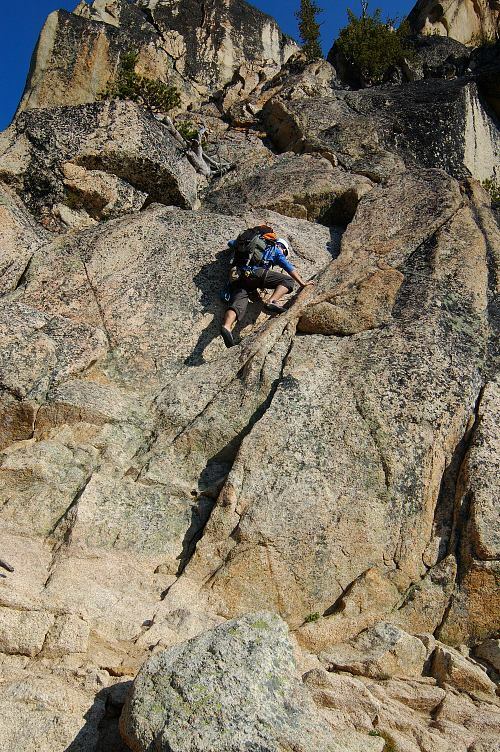 Below is Chuck leading out across the Whaleback, with Julie belaying him in case of a fall. Notice that if he falls, he'll go down and swing in to the rocks below Julie. This is definitely a no-fall area. Once past the Whaleback, the rest is easy. Here is Lisa leading up through the last bit of climby rock. Jamie followed her up. 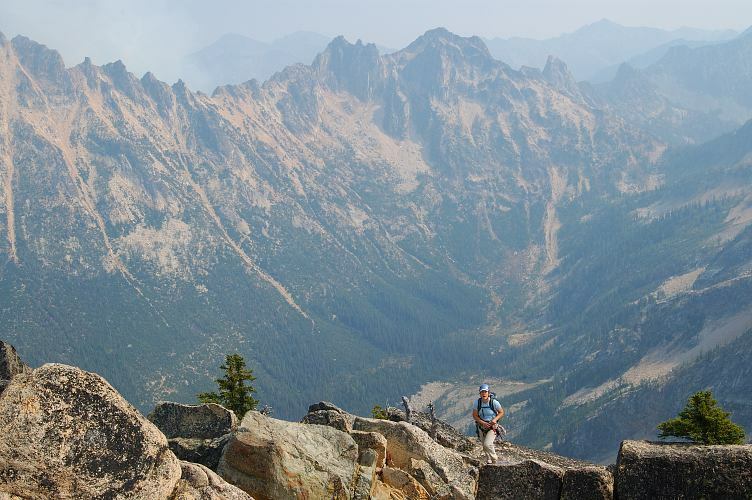 The huge, expansive views made the climb a real treat. Julie, the climb leader, was the last one to make the final scamper around the rock and to the summit. On the other side of the mountain ridge behind her, and to the left of the photo, is where a large forest fire is burning. It seemed to increase in intensity as the day went on. Joel and I had been on the summit for nearly two hours before the entire party was again together. We spent another thirty minutes enjoying the views and resting before beginning to retrace our steps down the South Arete. Rather than going back across the Whaleback as we had in coming up, Chuck led out and a fixed line was set up to avoid the danger of a swing. In the below photo, Joel is finishing up the Whaleback. Rather than rappel the entire route, we downclimbed a long way through the scrambly sections of the route, taking care not to fall when unroped. By moving slowly and taking care with our feet, this wasn't especially dangerous and got us to the more vertical sections of rock a lot faster than setting up rappels. Three rappels got us down the first two pitches and, very thirsty, we collected at the base of the peak around 4 pm for the hike out. From Lakewood, drive I-5 north to Mount Vernon. 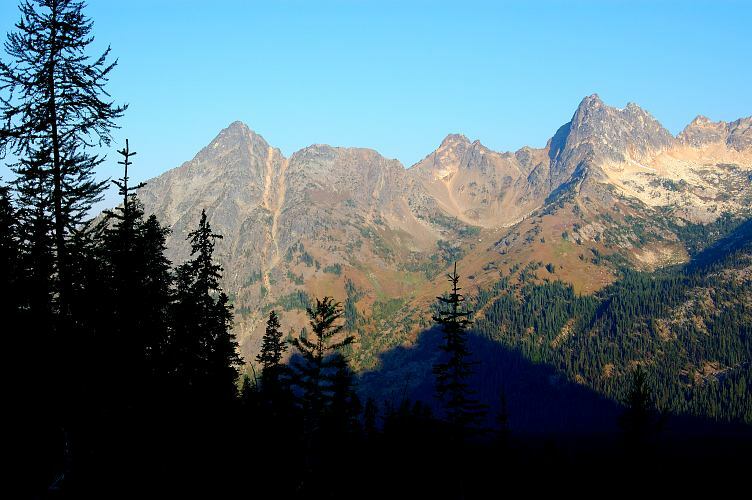 Take SR 20 (North Cascades Highway, exit 230) east for approximately 100 miles to the Blue Lake Trailhead. Note that services are non-existent after Marblemount, about 60 miles before the trailhead. You'll need a NW Forest Pass or other parking pass to park here. Hike the trail toward Blue Lake for about 1.5 miles until you reach an open slope, above which you can spot the Liberty Bell-Concord-Early Winters complex. There is a good, obvious climbers track here. 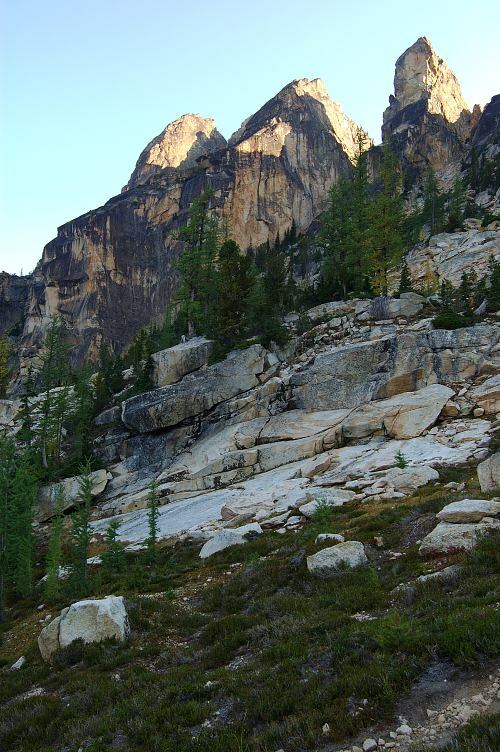 Hike and scramble up to the base of South Early Winters Spire, which is the prominent, right most peak on the ridge. The south arete route begins with a 15 foot crack climb and then a step across friction move, which is the hardest on the route. 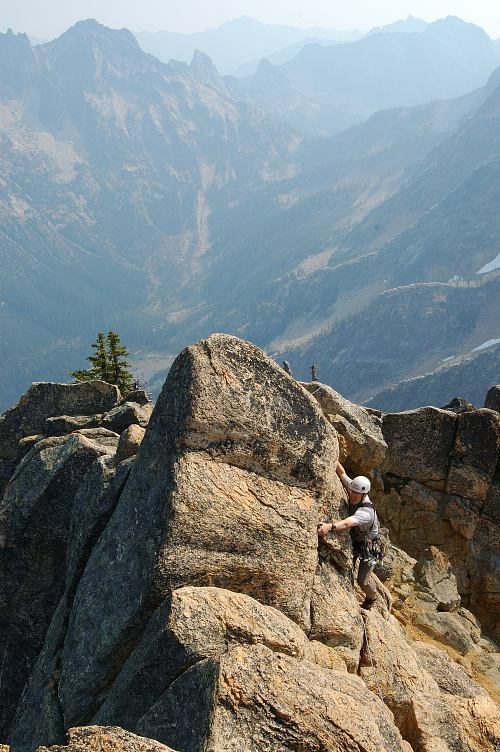 In mountaineering boots, it isn't super easy, but with rock shoes it shouldn't be bad at all (5.5). 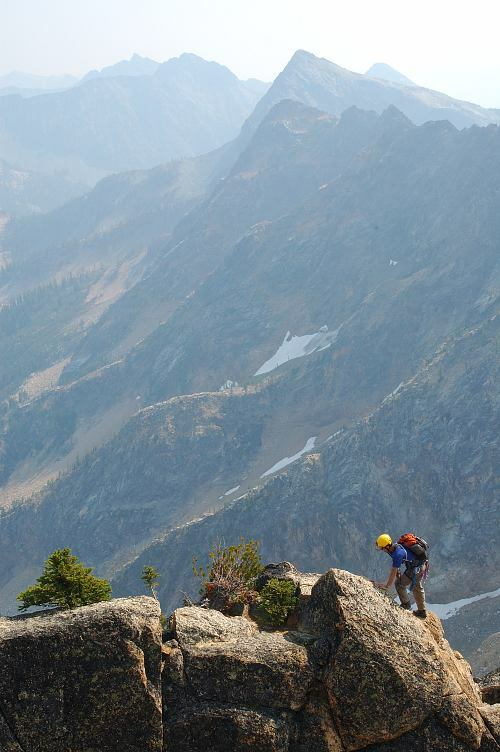 Climb up toward a mini-gully. At the head of the gully is a 12 foot chimney (5.4). Continue up on scrambly terrain, staying out of the couloir to your left. 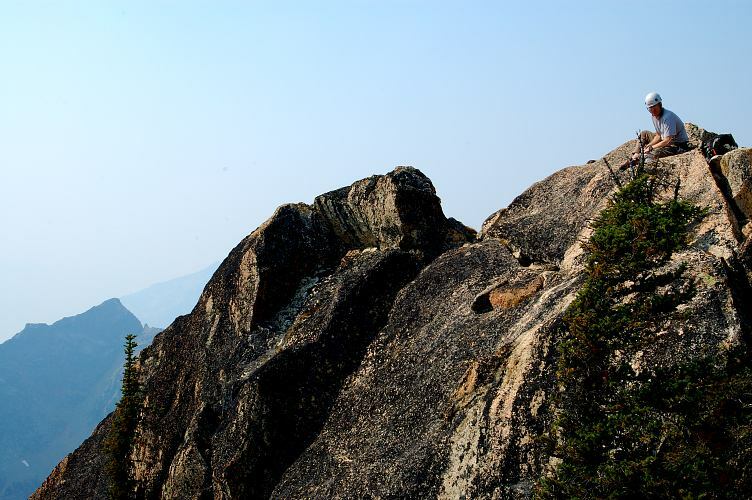 Make the top of the false summit and spy the Whaleback, an exposed, but easy, traverse that you can protect via a bolt midway across. Scramble, perhaps with a fixed line, to the top. Downclimb and rappel back to the base.